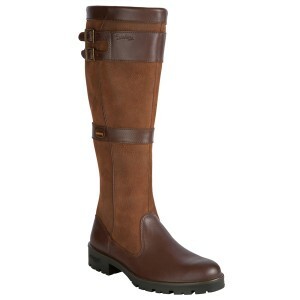 New for 2013 is the Longford Boot from Dubarry. This is a ladies knee high boot with a stylish double buckle detail. 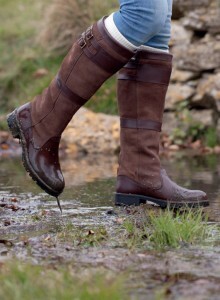 The Longford offers everything you’d expect from a Dubarry boot: waterproof, breathable and comfortable to wear. Made from Dubarry’s luxurious water resistant DryFast-DrySoft™ Leathers, and with a GORE-TEX® liner to ensure it is waterproof and breathable. Although this boot has been made with technical features, you are just as likely to see it worn in towns and cities as you are in the country. It is an attractive and feminine boot with the added buckle detail and the way the leather seam curves up towards the calf. Designed to be multi-purpose, the sole is a direct inject moulded bi-compound sole which is ideal for both urban and country environments. Dubarry has added an elasticated heel panel to assist with foot entry and for an elegant boot silhouette; there are also finger pulls inside the boot leg for ease of entry. Available in Walnut or Black, the Longford is already proving popular. Similar in style to the Clare in terms of shape and fit, this is an updated version with a slightly more modern feel. It should be mentioned that both the Longford and the Clare offer a slightly more slim fitting than other Dubarry boots such as the Galway, which is what makes them both attractive ladies boots which can be worn practically anywhere. Dubarry, Dubarry boots, GORE-TEX, Longford. Bookmark.